You gotta love old gym lockers, even in the garden. This flower bed is along one garage wall. The morning glory vines are not in bloom but alyssum and zinnia are filling in nicely. The bed is flanked by two laundry tub planters of geraniums and petunias. This flower bed is between the road and the patio. It is a bed of mostly colorful annuals with a few perennials here and there. Of course there are zinnias, Kris' favorite annual. A front view of the patio garden. Here a large galvanized trough of geraniums decorate the patio. I love this kind of junky, layered, type of container garden with vertical interest. This flower bed is always my favorite. Lots of annuals, lots of perennials, a cool garden path and lots of junk. This year this flower bed has a fun rock formation framing a small hosta. I love the old brick edging. More bricks and lots of interesting flowers and decor. The garden path is a little bit different every year. Are you catching the gnomes in the gardens? This garden has a very fun cement bird bath pedestal with a galvanized tub on top and framed by an old window. Old bench ends, painted orange add more whimsy. This bed at the front of the house has a dog in deep meditation. A green iron frog on a log! This garden has a shady spot so impatiens and begonias fill the right side with sun loving zinnias on the left. A rusty wagon with junk container gardens of begonias. A slatted wood piece, railroad spikes and part of a piece of fencing become garden art in the YARD OF FLOWERS. Jurassic begonias and impatiens are planted in an old stove. I hope you enjoyed the tour. As usual, it was a riot of color and lots of fun! Very, very pretty! Zinnias are my favorite flower, too! Thank you sooooooo much for sharing. I feel so lighthearted and happy after that tour and it has taught me a lot about adding height with simple things. So beautiful! Your sister in law really does have a green thumb. Oh, my goodness, your brother's garden is gorgeous! Love all of the mix of flowers and the little garden pretties. Kris' garden are beautiful! So many annuals - does she start them from seed? As a side note, I love your blog (it's one of my faves), but I hate that the ads run over the pictures. I'm not sure if you have control over that, just thought I'd let you know. Thanks for sharing! Gorgeous, thanks for sharing. 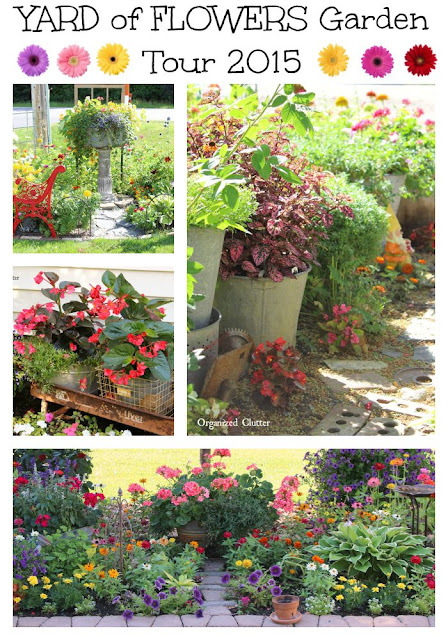 I love looking at different gardens to get ideas. Kris has a lot of great ones. Why can't I grow flowers like that? One thing ... the deer would eat most everything and I just do not have a green thumb. Lovely flower gardens and love all the added junk decorations. Thanks for sharing it with us. Beautiful. I always want to tell the people like her how much I enjoy their yards as I drive by. Oh my gosh Carlene - how gorgeous ! The flowers AND the art - I'm in love with the Dog Meditating ! All of it - it's just perfection - thanks so much for sharing - I'm going to pin a bunch of these !